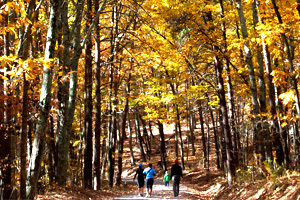 Enjoy a multitude of hiking opportunities starting just steps from your front door at Sky Retreat! From waterfall walks to rigorous exploration trails, Sky Retreat provides hiking opportunities for the whole family to enjoy. Spend a day exploring the spectacular beauty of nature in the Blue Ridge Mountains. The region is considered a temperate rain forest with lush foliage, beautiful vista views and winding paths. It is a vacation destination for outdoor enthusiasts or anyone wanting to a peaceful escape from the hectic pace of daily life. 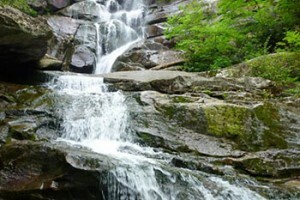 Cascade Falls is a gorgeous 6 mile round trip hike from your front door at Sky Retreat. It is a spectacular waterfall with beautiful surrounding trail systems extending from that area. It can be reached reached from 3 different trails ranging from a short walk suitable for the whole family to longer trails with interesting historical sites such as the Jesse Brown Cabin, a 19th century residence. From Sky Retreat it is a beautiful 2 mile hike each way along the MST trail to reach the Cascade Falls. The Mountains to Sea Trail starts just 1 mile from the entrance of Sky Retreat. It is North Carolina's premier hiking trail that stretches 1150 miles from the Great Smoky Mountains, through the Blue Ridge Mountains to the Outer Banks. It is a scenic backbone of an interconnected trail system spanning the state. 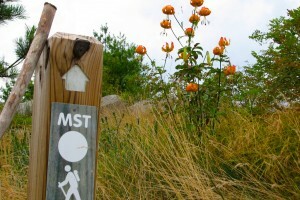 The MST has the distinction of being the highest elevation, long-distance trail in the eastern United States. The Blue Ridge Parkway, just 1 mile away from Sky Retreat, is noted for its scenic beauty with stunning long-range vistas and close-up views of the rugged mountains and pastoral landscapes of the Appalachian Highlands. It is America's longest linear park running for 469 miles. There are numerous hiking trails extending from the parkway through the beautiful Blue Ridge mountain range.